Yakima racks have been around for 35 years, and if like me you read international mountain bike and snow sport magazines you will have no doubt seen their ads over the years. A while back the US based rack company liked what ProRack were doing in Christchurch with their revolutionary Whispbar and promptly purchased the company. At the time I was pretty damn excited that Yakima might be entering the New Zealand market. It's taken a little longer than I thought but Yakima roof racks and platform racks are finally here and are available right now, in fact ours just walked in the door. A scroll round Yakima's website (complete with NZ pricing) shows you just how massive their range of products is, from ski to four wheel drive products and accessories, all the way to their large range of bike related products. The bike stuff is divided into a few lines but the most relevant to Kiwis would be the roof and hitch products. What's a hitch? Well it isn't a towbar. If you drive a modern car, chances are your towbar is mounted to a removable square sleeve. That is a hitch receiver and that's what most platform racks use. They are stronger than a towball and can handle a higher load. 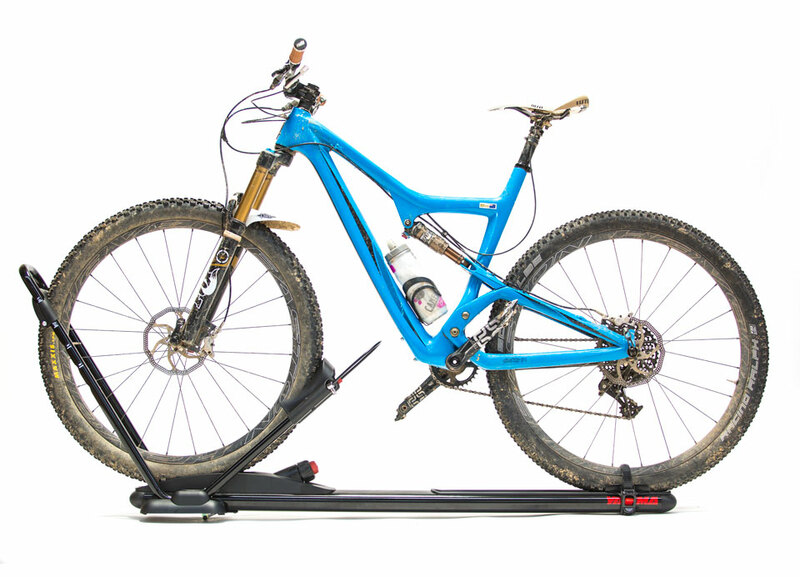 And the beauty of a Yakima platform rack is that the bikes on it will NEVER rub. Anyway, my Mazda6 and Lucy the Zuki don't have hitches, but I have rails so we've opted to test out Yakima's highest spec'd roof mounted bike rack the High Roller. There are a few racks in the lineup but the High Roller and its little brother the Front Loader are the business, and really, for speed and ease of mounting they're the two you should look into. They both take bikes from 20" to 29" and all sizes in between and don't require wheels to be removed. Once you have selected your wheel size on the front wheel holder you twist a dial to fine tune the hold force on the front wheel, then slide the rear wheel straps to the centre of your rear wheel and ratchet it up. Done. Ready to roll. The rack's hold is pretty damn impressive. Recently while in South Australia one of the shuttle vehicles we used during the trip was a custom trailer with six offset Yakima Front Loaders. To get to the top of one of the Melrose trails it was a full on rutted out 4WD track and the bikes and racks didn't budge an inch! The big difference between the two racks is in the way they secure the front wheel. On the High Roller pictured it's much quicker, the lower arm being able to just lift into place. The dial is then used to fine tune fit. To release, the red button is pushed and the arm releases. On the Front Loader there's no quick release and you have to use the spinning dial the whole way. It's still pretty quick, but after fitting this today the quick release is a welcome addition. Price wise the High Roller is NZ$349 and the Front Loader a little less at NZ$329 . Both pretty reasonable prices really for a very resolved piece of kit. The rear wheel is simply secured in this dual sided ratchet clamp, so no matter which side of the car you choose to mount it on you will have easy access. The front arm has a slideable fitment; just fold down the plastic arch, select your wheel size and mount away.